For the first time in Pakistan’s history, a noteworthy amount of female voters came out of their homes on Wednesday to cast their vote. The pictures of women going to polling stations to exercise their right to vote gave some really strong energetic vibes to the whole nation. Regardless of the fact that women in Pakistan got the right to vote in 1956, the nation plays dead globally on the subject of women’s participation in elections. Pakistani women in the district of Upper Dir headed to the polls for the first time in 40 years on Wednesday. The women in that district were forced to give up on their right to vote from the very first Pakistan election in the 1970’s just because of the mistaken belief expressed by the village elders that the honour and dignity of the community will all gone if their women will go out and cast vote for their rights and for a better life for their children. In previous elections, even those who were registered were not allowed to vote by men. But the bigger obstacle is religious and cultural prejudice. For example, during past elections, flyers circulated in the area warning men to not allow their female family members to vote, because women’s participation in democracy was somehow “un-Islamic” but we are glad this time they decided to stand out and sent their women out to cast their vote. To make sure the voting rights of women, the Election Commission of Pakistan clearly stated that the results of a constituency would be declared null and void if the female vote count would be less than 10% of the registered female voters of the area. 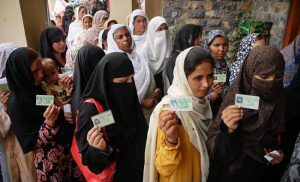 This time, the Federally Administered Tribal Areas (FATA) also showed immense progress in women’s representation and participation in Pakistan’s 11th general elections. Kurram tribal district’s independent candidate Ali Begum, the only female from FATA to run for elections, observed women’s presence at the polls. Female voters constitute 44.1 percent of the total eligible voters across the country. 3.8 million female voters have been added to the electoral roll whereas, the number of registered transgender has also significantly increased. Around 105.96 million voters across Pakistan registered for the July 25 elections. Women comprise 46.73 million, about 44.1 percent of the electorate. The female voters registered for the July 25 elections have increased by 24 percent as compared to the 2013 elections. If we look at the last general elections of 2013, over 95 percent of the registered women did not vote in at least 17 National Assembly constituencies. 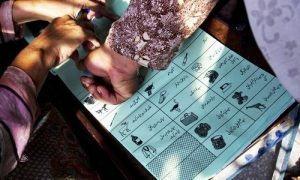 A recent analysis of district-level data by the Election Commission of Pakistan (ECP) revealed that even in the most developed parts of the country, such as Lahore and Faisalabad, the gap between male and female voters is more than a half-million. Whenever women are deprived of their right to vote, their voices are diminished in Pakistan’s already patriarchal politics. This also leads to the problem that lawmakers will less likely address to women concerns and it will become more difficult for the women who seek office to attain their rights. The author is a content writer and likes to write on art and culture.